Morgan Roberts looks back on a action packed year of Rugby Union in 2017, and previews whats ahead in 2018. What a year of Rugby Union it has been. We’ve seen the Exeter Chiefs lift their first Aviva Premiership crown, a thrilling Lions series that ended in a draw and a fantastic Women’s World Cup that saw New Zealand regain their crown. Our rugby correspondent Morgan Roberts reviews it all. 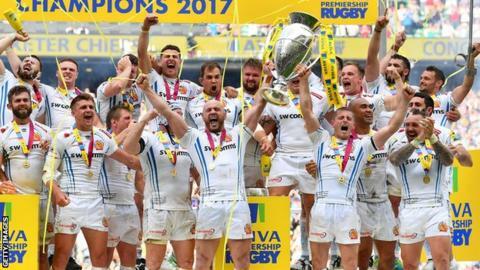 This year has seen the continued rise of the Exeter Chiefs, winning the final at Twickenham for the first time in May, after an impressive home semi-final performance against Saracens. The Chiefs have been going strength to strength from the start of the 2017-2018 campaign, as they are now eight points clear at the top of the league table. The team who have made the biggest strides of improvement has definitely been Gloucester. In May, they were finalists in the European Challenge Cup but fell to a disappointing defeat against Stade Francais. However, with Ackerman Snr in the coaching staff and Ackerman Jnr coming into the back row on the field from South Africa, things have started to blossom at Kingsholm. Gloucester are now in second place in the Aviva Premiership Table. Gloucester’s second place is slender however because each team below them in the league has one point less in descending order, Gloucester have 32 points and it goes down to 28 points, where the Leicester Tigers sit in sixth place. Therefore, the games over the latter stages of December and January will be crucial for the season for the top eight sides in the Aviva Premiership. The battle to be in the top four at the end of the season is incredibly tight, with Saracens and Bath making up the teams in 3rd and 4th place currently, but Wasps and Leicester Tigers are hot on their tales. Most recently, Northampton have provided the biggest news with the sacking of Jim Malinder, who was in his tenth year at the club. This came to an end after a series of ten straight defeats in all competitions and for the board of Franklins Gardens it was enough. The battle at the bottom of the table is hotting up with Worcester getting some crucial wins over the Saints and the Tigers to leap frog London Irish. Irish are going to have to really get some points on the board and quickly, otherwise it looks that Pat Lamb’s Bristol will take their place in the Aviva Premiership next year. The competition increased from 12 to 14 teams over the summer with the Southern Kings and the Cheetahs coming in after being axed by SANZAR from Super Rugby. The teams are now split up into two conferences but there were promises that local derbies would still be kept, for example the Ospreys vs the Scarlets and Cardiff Blues vs the Dragons (formerly Newport Gwent Dragons). Personally I was not sure how the regions would be able to cope with the extra cost of travel and miles on the clock to attend games. However, it seems to have improved the teams exponentially and it seems to give the players an extra range of skills and experiences to continue their development. The Cheetahs, for me, have been worthy of their inclusion as they have very athletic players and certainly test out the European teams for pace, with the result that they are in third place in Conference A. Leinster, Glasgow Warriors, the Scarlets and Munster have continued to be strong forces in the competition. Les Kiss is under pressure to create a more elaborate style of rugby for Ulster to win games, and Edinburgh are also going up with the inclusion of former Leicester Tigers boss Richard Cockerill. The Dragons are on the hunt again, Brendan Jackson saying he’s looking to recruit up to 11 players to come into the squad, the most recent being Richard Hibbard and Ross Moriarty from Gloucester, maybe even a certain Quade Cooper, who has been axed by the Queensland Reds in Australia. The tournament could have seen England become the first team to win back to back Grand Slams in the competition and gain the record for the most consecutive wins for a tier one nation in world rugby, overtaking New Zealand. However, the men of the emerald isle didn’t allow that to happen, even if it was a boring game to watch from both Ireland and England. The two games of the championship were when Wales hosted England and Ireland, there is just something about rugby being played in the Principality stadium in Cardiff that is like no other experience in rugby. Both games contained high drama, ear blasting noise and superb rugby from all three teams across the two games. The inclusion of a bonus point system was a big improvement for the competition this year, the 4-try and loosing bonus points were pivotal to the overall result of the competition. France continued in their poor form, not showing their flair from the 70’s. Italy’s performances really brought to light the notion that there should be a relegation system with the team that comes last in the 6 Nations and the winners of the Rugby Europe Championship to play a playoff match to be included in the Six Nations. If that were to be done this year, Italy and Romania would have battled each other. An idea that the two competitions should really consider implementing after the Rugby World Cup in 2019 because both championships could do with another element of increase the competition. Th restart of the competition has already seen some outstanding performances from the likes of Leinster, Munster, Clermont Auvergne and La Rochelle. The week before last saw all six English clubs in the competition loose to their respective opposition; some pundits claiming that it is because of the refereeing styles of referees outside of England. Whatever it may be, we have to remember, a lot of the fixtures were not on home soil, apart from the Cheifs game against Leinster. Regardless of this, we are still seeing fabulous talent being shown. The biggest talking point thus far, had to be the debarkel of the first Saracens vs Clermont Auvergne game in South-West London. The game having been called off and then rescheduled a day later, did nothing good for the home side, as they suffered their worst defeat in the competition in recent times. Saracens did redeem themselves somewhat against Clermont last weekend, but there could be a situation where the current champions would not make the quarter finals, unthinkable given how Saracens have performed in the last two years. This could pave the way for the Ospreys to enter the quarter finals for the first time in a while, with the likes of Dan Evans playing out of his skin at the moment. The Irish and French sides are doing very well in this year’s competition, as I said earlier and taking into consideration the likes of Montpellier and Ulster, the knock out stages ought to be a cracker. The tournament was a brilliant occasion and saw passion for the home side and stand out team performances from the two finalists, England and New Zealand. Lydia Thompson and Portia Woodman, the two wingers that especially lit up the competition for England and New Zealand respectively. When it came down to the final, the speed of the half backs of New Zealand proved to be the real difference, England still are looking to beat New Zealand in World Cup Final. The tournament also felt like a gauntlet laid down by the Irish nation that they could host a Rugby World Cup and host it well; unfortunately, this was not to help the bid for the Men’s Rugby World Cup in 2023. The prospect of playing against the back to back Rugby World Cup Champions would daunt most teams, but not Warren Gatland and his British & Irish Lions Squad. The men from England, Ireland, Scotland and Wales faced one of the most gruelling tours any British & Irish Lions side had faced before, and in the main the tour could be considered a success. The All Blacks showed their class with great performances from Rieko Ioanne and Beauden Barrett. However, a resurgent Lions with players such as Liam Williams, Elliot Daly and Johnathon Sexton, clawed it back in the second test. Yes, the finale was not the one that most people were expecting and people complained that it felt flat after the final test match. However, coming out with the 400 to 1 possibility of a draw was something that the Lions players especially should consider in a positive light. Now the challenge of the Lions in three and a half year’s time will be South Africa, and lets all hope that the Springboks improve for that series of test matches. The action from last month saw all the home nations take on the forces of the summer hemisphere teams. England cruised through their three games against Argentina, Australia and Samoa; all be it with England not playing champagne rugby. Wales will ultimately look at this Autumn with disappointment with two unconvincing victories over Georgia and South Africa, and two losses to Australia (for the thirteenth successive time) and New Zealand (still to gain a win over the All Blacks since 1957), both fixtures conceding crucial scores in the second half. Scotland made great strides again under Gregor Townsend again, coming very close to defeating the All Blacks for the first time in their history, a competitive win over Samoa and thrashing the Wallabies in Murrayfield. Ireland also had a successful Autumn series, matching England by winning all three of their games; hammering a woeful Springboks team, narrowly beating Fiji and claiming revenge over Argentina from their previous meeting in the 2015 Rugby World Cup. Yohan Huget not being punished after Wales vs France fixture – Now there a lot of challenges in games that might get noticed and punished, either during the game or afterwards. However, not this case. During the overtime period that Wales and France played in the final game of this year’s RBS Six Nations, footage was caught of Yohan Huget, putting his head into the cradle of George North’s arm. North then came up to referee Wayne Barnes to show a bite mark. Barnes I want to stress out at this point did absolutely everything correctly with the procedure. However, the same can not be said for several people in the process: Yohan Huget, TMO Peter Fitzgibbon and the French broadcasters. Huget, in my opinion, was clearly guilty of the charge of biting George North, if seen, it would have been a red card, Wales would have been awarded a penalty and probably escape the last assault the French had on the Welsh try line. Secondly, the commentators of the BBC put two and two together seeing the actions of Huget and the direct consequences of it, however TMO Peter Fitzgibbon (Ireland) did not; how can something that is spotted by the commentators be ignored by the TMO? And finally the French broadcasters, they were responsible for the coverage of the game and showing the incident unfold. Only one angle of the incident was shown, clearly a tactic from the French broadcasters to not show more evidence that could lead to further sanction. It was probably one of the most mesmerising and fundamentally floored piece of adjudication I have seen on a rugby field in recent years. I want to re-iterate that Wayne Barnes did all of that was asked of him and the right protocol was made. This incident needs to be looked at more closely by World Rugby. Ireland not getting to host RWC in 2023 – World Rugby is a charity and with the voting that took placed, they would be relieved with the decision for the 2023 Rugby World Cup to be hosted in France. This is because a lot of money will be generated from this tournament, as the Rugby World Cup in 2019 in Japan is more a risky investment. However, this is all from a financial accountant sort of opinion. As a rugby fan, I was shocked and horrified that France got the vote and not Ireland. There was also word that Ireland would not be able to accommodate all of the fans and it would cause congestion in Ireland. First of all, Ireland proved this year they can host a World Cup, and imagine games being played at Thomond Park, let alone the Aviva Stadium. I also think that World Rugby would have made as much money in Ireland as they will do now in France. In terms of fairness, and it isn’t, France hosted the World Cup in 2007, Ireland have not had the opportunity and it is a travesty in my opinion that it is not being hosted in Ireland. British & Irish Lions finishing in a draw – Now a lot of people were disappointed with the end of the tour, as there was no defining settlement to see who would win the series. However, all of the British & Irish Lions tours recently have always been played over three test matches. The real culprits were the All Blacks themselves as they had numerous opportunities in the third test to win the game; but with costly errors and great defence from the British & Irish Lions, a draw was the end result. To take a draw against the current back to back world cup champions is not too bad at all. Samoan rugby financial crisis – For the islands in the Pacfic, with the lure of big money offers from France and England, very little money is sent to the grass routes level in their home countries. Samoa is no different and England Rugby were very generous with the help they gave. To put into context however, the England players got £22,000 for playing against Samoa, the Samoan’s just got £400 for playing against the English. It really opens up the debate again about the tier one nations getting richer and richer and the tier two nations becoming poorer. World Rugby need to have a look at how the books could become more balanced between tier one and tier two nations. However, regardless of this, Samoa in patches played great rugby against Scotland, Romania and England; they rolled up their sleeves and were proud to play rugby for their country. The Media provoking Michael Chekia – It was not good practise by the media representatives representing the broadcasters of the England vs Australia game, to provoke a heated response from Michael Cheika after the match. Michael is a very passionate man and international matches are won on fine margins; the result flatters England quite frankly as it was a very close game with ten minutes to go. What happened was not kind to Michael Cheika and to then loose to Scotland the following week, ended what has been a poor year as far as the Australians would be concerned. Michael Cheika not doubt will get the Australians back to winning ways I am sure and the summer tour against Ireland will be eagerly watched by all. Natwest 2018 6 Nations – the rugby from November, shows that the three teams that will compete to become champions will be England, Scotland and Ireland. If England were to win it, it would be the third successive time they had won the competition. Italy I predict to come bottom again, and with Wales’ 24 man injury list, it would be a great achievement to finish above France in fourth place. Aviva Premiership – It’s hard to think that Exeter would not end up in the top four, even harder to think that they will not have a home semi-final. The battle for the remaining three places will be very competitive, although the team that picks up form towards the end of the season would look to be strong favourites, and it is difficult to know who would be with Exeter in the top four, let alone who would be in the final in May 2018. I think that the performances from Bath, Leicester Tigers and Wasps will be very important to determine the outcome. With Saracens in a patch of bad form, it would be a great story of perseverance for them to still be in the top four come the end of the season. Pro 14 – it might be a safe bet, however I believe that with the form of Munster and Leinster, it could be an all Irish final that we see next year. On the other hand, the Scarlets now have the know it all to play their way into a final. It will also be interesting to see how other teams like Glasgow Warriors, Ulster and the Cheetahs perform come the end of the season. European Champions Cup – personally I don’t think that we’ll see many English clubs at the knock out stages this year, the competition from the French and Irish teams especially look to be very strong. It is very hard at this point to say who will be in the semi-finals but I think it could be Munster, Leinster, La Rochelle and Clermont Auvergne, what stories it would be for all of them if they were to win it; especially Clermont Auvergne, last year’s finalists, always the bridesmaid and not the bride, could 2018 prove different? Summer Tours England (South Africa), Wales (Argentina), Ireland (Australia) and Scotland (USA & Canada) – I believe all four home nations should be looking to gain complete series wins on their respective summer tours. The team with the most challenging prospect will be Ireland going against Australia. A summer series between the teams at fourth (Ireland) and third (Australia) in the world will be the most closely watched by all fans. Scotland will look to evolve their attacking style of play with a tour of North America. Warren Gatland will lead Wales to Argentina, a hard brutal tour with the caldron of the rugby stadiums filled with passionate Puma’s fans; a real test of character with the current injury list they have. England should cruse to a three test match successful tour if the Springboks continue in their woeful fashion under Alsitar Coetezee.